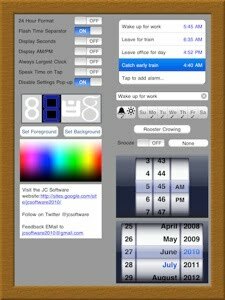 The design of the program was such that anyone with an iPad could use it as a large bedside clock with easy to read numbering from a distance (i.e. without having to put their glasses on at night). It had dimming functionality as well as pinch to zoom number resizing. It also supported alarms however was never intended to be an alarm clock. There were four fonts to choose from and a live colour picker that showed the fore/background colours changing as the colour was modified. I spent a fair amount of time working with a Beta team to get an iPhone/iPod Touch version that worked back to the original models however with 2-3 weeks of coding remaining the project was stopped due to personal issues. Some day I may revive the app. It hasn’t been updated in over three years now and yet I’m still tracking people using the app and get the occasional email from users reminding me that there was a market (however small) for such an unusual clock app. “The “My Bedside Clock” application is intended to be a replacement for your old bedside clock but with all the features the iPad can provide. Now with version 1.1 and an iPad running iOS4, alarms will sound even when the clock is not running. If you’re like me with bad eye-sight, you want the numbers on your bedside clock to be the biggest possible size in a bright and easy to read font. Choose from four different font styles and pick whatever foreground and background colour you like from the easy to use colour palette. My Bedside Clock gives you the ability to have the time always fit itself automatically to the screen - always the largest size - all of the time. There’s no clutter unless you want it. Selectable seconds, 24-hour format, AM/PM display, and flashing separators. It works in every orientation of your iPad for maximum flexibility. Want to adjust the size of the time yourself? You can using pinch-to-zoom. Shrink it or expand it whatever size you like. My Bedside Clock remembers your settings in each orientation so every time you load it, it’s just the way you like it. Talking Clock: Turn on the speak the time option and when the clock is visible, a tap of the screen will read you the time in whichever format is selected. Multiple Alarms: Add as many alarms as you like with repeats for each day of the week and a choice of 8 different audible alarms. For something more discrete, a visual alarm will flash the screen. Snooze is independently settable for each alarm. Due to OS limitations, currently alarms only work when My Bedside Clock’s clock is showing. Accessing the settings is easy - swipe your finger up and the setting screen slides up from the bottom. To return to the clock, swipe down and the settings will slide back down. No fuss, no clutter. Just the time, with no distractions.